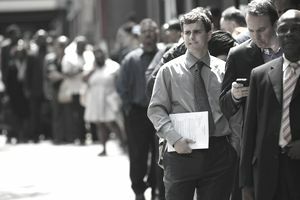 The unemployment rate is the number of unemployed people divided by the total number of people in the civilian labor force. Before you can use the formula, you need to understand the definitions of all these terms. First, the Bureau of Labor Statistics has a specific definition of unemployed. To be counted as unemployed, you must be over 16 and have been available to work full-time during the past four weeks. Most importantly, you must have actively looked for work during that same period. The only exception is if you were temporarily laid off and simply waiting to be called back to a specific job. The civilian labor force also has a very specific definition. It includes the unemployed plus the employed, no one else. Unemployment Rate = Unemployed / Civilian Labor Force. The BLS designates lots of other sub-groups of people who would like jobs. Some fall into the definition of unemployed and some do not. Make sure you're familiar with these terms so you don't get confused when they're used. They give you the full picture of the labor force in the United States. Long-term unemployed: If you've been looking for a job for the past four weeks, and you've been without a job for 27 weeks or more. Marginally attached to the labor force: If you haven't looked for work in the past four weeks, but you have looked sometime in the past year. Discouraged workers: If you've looked for work anytime in the past year, but not in the past four weeks, you're no longer counted as unemployed. But discouraged workers would still like to have a full-time job. They just feel they're too old, don't have the right skills, or will continue to face discrimination. The BLS calculates several alternative unemployment rates. One is the “real” unemployment rate, which includes the marginally attached and discouraged workers. It also includes those who are working part-time but would prefer full-time work. Many people say it is the true unemployment rate because it counts everyone who would take a full-time job if it were offered. It’s an effective way of really measuring the slack in the labor force. The labor force participation rate is similar to the unemployment rate. The only difference is that you take the number of employed and divide it by the civilian population. Frictional unemployment accounts for voluntary job turnover, such as when people quit a job they don't like to get a better one. Structural unemployment happens when job skills no longer match any new jobs. That's usually caused by, and also leads to, long-term unemployment. The third component, classical unemployment, is caused by wage and price controls, minimum wage laws, and unions. Cyclical unemployment is the type the media talks about the most. It rises dramatically during the contraction phase of the business cycle. By the time it takes off, a recession has already started. That's because unemployment is a lagging indicator. Companies wait until they're sure demand won't come back before laying off their workers. The U.S. unemployment rate by year shows the rate in December of each year. It gives a broad-brush review of how bad unemployment was. It reveals that unemployment exceeded 10 percent twice. It was between 14 percent and 24.8 percent during the Great Depression. It was greater than double-digits between 1931 and 1940. The only other year that ended above 10 percent was 1982, when it was 10.8 percent. Current unemployment statistics reveal that it's below 5 percent. The area chart below tracks the yearly unemployment rate from 1929 to 2018. The unemployment rate has improved since the Depression. One reason is because the government knows more about preventing it. Research reveals the most cost-effective unemployment solutions are jobs programs. They create more jobs that tax cuts. Also, extended unemployment benefits are the best way to boost the economy. The unemployed are most likely to spend those benefits on day-to-day needs. They put each dollar back into the economy, boosting growth. Another use for the unemployment rate is to calculate the misery index. It is the combination of the unemployment rate and inflation.